For as long as I can remember, animals have been a huge part of my everyday existence. We had a few dogs as I was growing up but I didn’t get my first Great Dane until I was 21 years old. We adopted Max when he was a year old and I’ve been hooked ever since. Prime, who is pictured above, was my heart dog. He is the first dog for me to train and show in Rally and Obedience. A true example of a gentle giant, what our breed is known as. 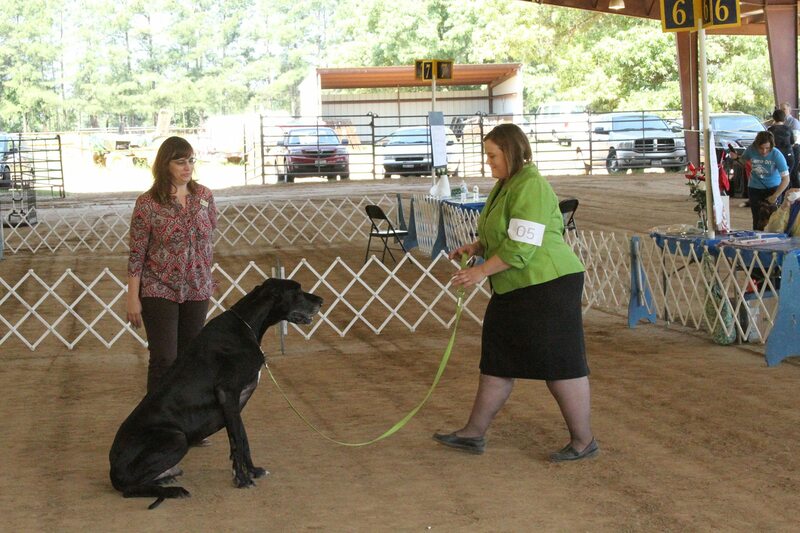 We had a blast training and showing. Prime even qualified for the 2015 AKC Rally National Championship in Rally Novice. Sadly Prime passed away in December 2017 in his sleep. I will forever remember his sweet loving nature and all that he taught me. If you would have asked me 10 years ago if I thought I was going to show dogs actively in conformation and performance events, I probably would have given you one of my funny looks. Passion brings you to places you never thought you would go and that place is a “Dane” place for me. #1 – Never being alone – Literally, you are never alone. You will never eat alone, sleep alone or go to the bathroom alone. They must help you….LOL! #2 – If they fit, they sit – Who am I kidding? Even if they don’t fit, they sit. They need their own back up beepers. #3 – Slobber becomes a daily part of your wardrobe collection and so does a drool rag. #4 – No matter how many times you have heard these two phrases, “I bet he eats a lot” or “You can put a saddle on that thing”, there’s always someone else out there to remind you. #5 – If you ever get that feeling that you are being watched, you are, but don’t worry…. It’s just a Dane! #6 – No matter how hard you try not to laugh at them, you fail, miserably….every single time. I could add so many funny things to the list regarding this clown of a breed but I will cut it short there. 😉 To love or be loved by a Dane, is such a blessing.